What is Twitter actually for? These days, Twitter is as much a part of our everyday lives as drinking coffee or taking the car out. Whenever we sit in the movies, go to a concert, or see something interesting on the street, it’s inevitable that at least half the people around us are tapping on their smartphones, and updating their status through a nifty tweet as they watch. Because of this, many small businesses may feel a little jaded with Twitter, thinking it has been taken over by self-promotional activities, political grandstanding, or youngsters updating their site with a stream of mundane drivel. Despite the Twitter phenomenon becoming ever more popular and mainstream, however, it is still a great tool for marketing your business effectively, and building strong relationships online with your customers and peers. Twitter is essentially a public text messaging service. Whereas many of us like to let one or two of our closest friends and colleagues know what we are up to, Twitter publicizes your antics to the whole world. The site which started out as a miniature blogging concept has now revolutionized online communications, inviting ever more public and controversial figures to share their thoughts and actions with the online world. Executions, political spats, governmental updates, and celebrity break-ups are all announced through Twitter, leaving no doubt as to the power and magnitude of this social phenomenon. If you are the sort of person who would rather text message someone on your mobile than give them a call, then Twitter is probably ideal for you. Short, sweet, and to the point, the site’s restrictions on word count and content mean that no-one can spend a long time updating their status, and you can get what you want people to know out there with minimal effort. The very brevity of Twitter is the attribute that has made it so successful, leaving people who are nervous of Facebook and its in-depth plumbing of people’s lives, flocking to this more succinct and economically-worded site. Essentially, Twitter features two basic functions. It enables people to follow updates that you post, and allows you to follow those people whose updates you want to read for yourself. The concept is simple – it’s taking the status bar from Facebook, and focusing upon that as the primary means of contacting others. Because of the simplicity of Twitter, it has become widely used as a business and marketing tool, enabling online entrepreneurs to share information and updates about their products and services, for free. People who regularly use Twitter can glance across their page and catch up with updates from those who they are following, for simple, quick, and easy access to the latest goings-on. Follow people across your industry so you can stay right up-to-date with issues, changes across the business, or new innovations. Connect with people to share best practice and advice, and ask for help when you need it. Set up search terms to get a list of tailored tweets (even for people who you may not be following) to stay abreast of issues that are of interest for you and your business. Ask people for services, and offer your services to others. Remember that you need to sell carefully, as Twitter is not primarily designed for cold approaches – build up relationships first, and offer your support when asked. Conduct market research on certain products and services in your market, to ascertain what people want, and how best to provide it for them. Send out requests for feedback, shares, and comments on blog posts or new webpages you’ve developed. Market your products and services in a friendly and approachable way to those people who follow you on Twitter. Offer an instant customer service to people who mention you or your products, keeping an eye on potential complaints and addressing them promptly. Network with a group of people with whom you can quickly and easily connect, and with whom you can develop ongoing and strong relationships. Twitter is fast, simple, and easy to use, and doesn’t have the invasive quality of a direct email. It’s ideal for short, pithy comments and marketing messages, as it is restricted to a 140-character limit, meaning you don’t have to spend hours crafting your messages. However, using Twitter is the same as any other online platform, and governed by the same rules. Stay clear of spamming, keep your Tweets professional and friendly, and avoid bombarding your potential customers with reams of sales material. You can use Twitter with a number of tools including TweetDeck and HootSuite to manage your list of contacts efficiently, searching through the messages posted by other people quickly and easily. If you’d like to know more about using Twitter for your business marketing and advertising, there’s a great little guide available at http://www.wikihow.com/Use-Twitter. There are loads of different features available for Twitter, so have a look around at what you can achieve, and develop your knowledge to provide focused posts with techniques such as hashtags. If you fancy sharpening your tweeting teeth on someone, my address on Twitter is @BlogTechGuy! HootSuite is asimple to use online application that lets you combine all of your social media accounts into one, incorporating Twitter, Facebook, and LinkedIn. It enables you to schedule, send, and receive messages across multiple platforms, all from one place. By bringing all of your social networking into one application, you can save hours of time. There’s a simple HootSuite plugin for Firefox through which you can schedule messages and follow RSS feeds. If you find maintaining social media accounts too time-consuming, try using HootSuite once a week, scanning the feeds to see if there are any interesting conversations that you can join, “like,” or share. HootSuite also allows you to upload multiple messages in advance and then pick the date and time that you want them to appear. In around half an hour a week, you can do all of your marketing and social networking in one go, saving a great deal of time compared with going into each site individually. It is, however, worth keeping the HootSuite application open while you’re working, so you can respond to any direct messages in a timely manner. TweetDeck is considered to be the most useful and practical application available for managing your Twitter account. You can customize the interface to control the users, tweets and columns on your account, saving valuable time and making Twitter easy to manage and use each day. TweetDeck allows you to write status updates, create short URLs for webpages, shorten messages, and apply hashtags to your messages, all from one simple interface. Easy to use, fairly intuitive, and convenient, it’s a great way to access your Twitter account and use it without any undue pressure. TweetDeck provides options to start new groups, manage them, and choose members for each, enabling you to send out direct messages to specific groups of people. You could, for example, divide your updates into personal, business, family, or advertising messages. There is an advanced search option that lets you see all recent tweets that may be relevant to you, and you can use this to start new conversations with people. Posted on September 4, 2012 June 8, 2012 Categories Social NetworksTags hootsuite, social media, Tools, tweetdeck, Twitter17 Comments on What is Twitter actually for? Free Screencast Tool – Jing! As recommended to me by a client, David Congreave, via Twitter, there is a great free screen capture and screencast tool called Jing. Created by the makers of the paid-for Camstasia (TechSmith) Jing is a simple free application that lets you easily capture screenshots or videos on your desktop. Its simplicity is brilliant, simply select the area you wish to capture, choose video or image and then go. If you select image you can then easily annotate the image with arrows and text. If video, you can choose whether to record audio or not. Once complete you simply hit the share button and it will upload the image or video to screencast.com and give you a URL to share with whoever you want to. It’s so easy and fast. Of course, with simplicity come downsides. You cannot do everything you want when editing an image. You cannot edit a video at all, it’s a one take wonder. Videos are limited at 5 minutes, and your screencast account has an upload limit and monthly bandwidth limit, both of which can be increased by paying for a Pro account. After failing to get the browser based Screentoaster working (damn you Flash! ), Jing actually seems to be almost everything I was looking for. Now, when a client wants to know how to solve an issue I can send a quick video of how to do it without having to waste time editing it, producing it in the correct format, figuring out where to upload it to and host it. If you need to visually show people what you’ve done or how to do things, then take a look at Jing. 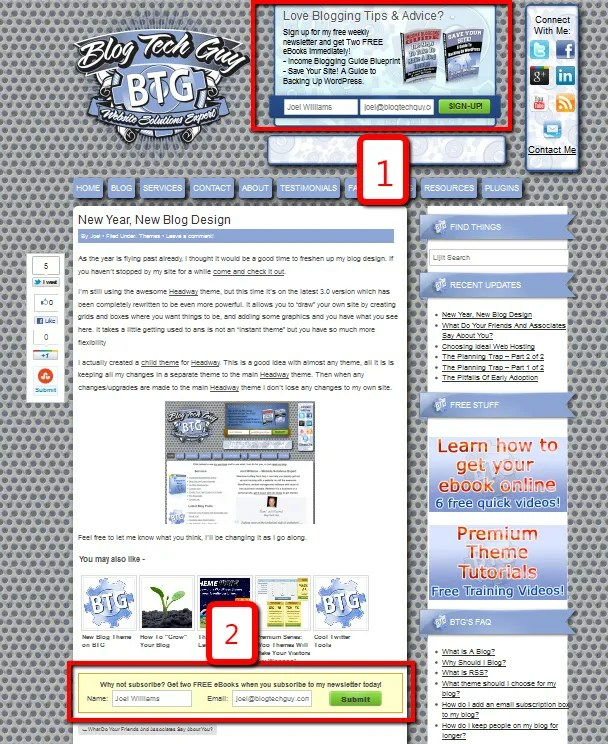 Posted on March 20, 2009 Categories Web ToolsTags jing, Tools2 Comments on Free Screencast Tool – Jing! Do you use Twitter? The short conversation (or some say “micro blogging” ) tool is a great way to keep in touch with your friends, family, business partners and clients. There are many tools out there that interact with Twitter, and an internet search will bring up lots of top 10 Twitter tools lists, but a couple of tools have come to my attention as I’ve been using them for clients recently. The first is Twitterbacks created by Jim Kukral. Essentially a selection of free Photoshop files that you can download and use as templates for your Twitter profile page. Very easy to use, and free. Yaro Starak reports that he has noticed “Twitter.com profile pages are starting to rank in Google really well. Might be an SEO strategy there!” and so isn’t it time you looked at your profile page? My Twitter profile page needs a bit of work I admit, but I’m waiting for my new blog design to create a consistent image – oh yes, a new blog design is coming soon but more on that sometime soon! The second is a plugin called TweetSuite that can display TweetBacks on your site (like Trackbacks or Pingbacks, above your comments), automatic tweeting of new posts, and many other features that you can choose to use or not. While you’re playing around with Twitter, why not follow me? Do you have any other Twitter tools, tips or tricks you would like to share? A great tip from Brendon over at Tailored Consulting: a way to see how your website looks in 40 different internet browsers and operating system combinations via BrowserShots. Frankly I’d never heard of half the browsers, but it’s still a really useful free tool.